Daniel Phillips from Tamworth was crowned "English Amateur Poker Champion" when he won APAT's Inaugural live event at the Broadway casino in Birmingham on 23-24th September. Richard Prew caught up with Daniel on the day after his triumph to find out more about the winner of the competition, his victory and his thoughts about playing in an EPT event. UKPN: Could you tell us about yourself please? Daniel: I'm 31 and have been married for 4 years to Michelle (although we've been together for about 13 years now!). I work in Online Marketing, and currently work for a new car sales portal called BuyYourCar.co.uk that was launched less than 2 months ago. We bought a house in Tamworth 3 years ago as both Michelle and I work in the Midlands – although we've lived all over the country. UKPN: What is your previous poker experience? Do you play live and/or Online? Daniel: To be honest, my previous experience is limited to say the least. I've probably played a handful of live games – and most of these have been games with friends. Virtually all my poker experience is online. I usually play cash games, as that's where I thought I was best – but I might rethink that a little now. I usually play the $1/$2 NL tables online. 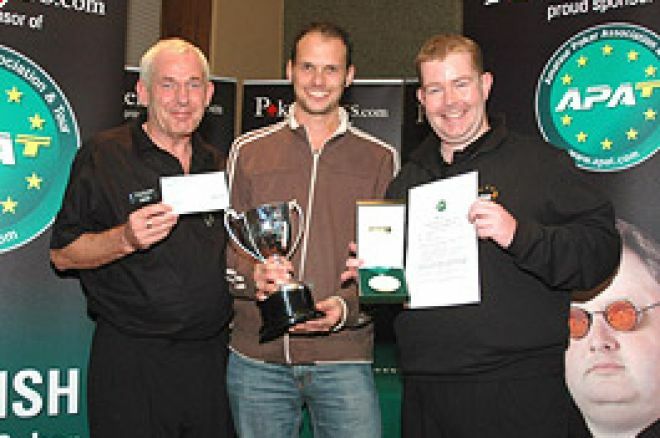 UKPN: Do you have any previous poker successes? Daniel: Not really. I've won the odd online MTT, but the most I'd won before in a tournament was about $500. I've won bigger pots in cash games than I have in tournaments, until now that is. I do consider the fact that I'm playing a success. I started out with a $20 deposit about 2 years ago, and played the micro-limit tables to start with, until I learnt how to play correctly and my bankroll allowed me to move up. I haven't deposited anything else since then, and have built my current bankroll from that initial $20. UKPN: How did you hear about APAT? Do you have a background with any poker groupings or forums? Daniel: A friend on a non-poker forum who plays a fair bit told me about it. It sounded like a great idea, and I joined the APAT and hoped I'd get in. I was actually on the reserve list, so I wasn't expecting to get a place. Unfortunately, my friend didn't get a seat! UKPN: What were your impressions of the Broadway casino? UKPN: Can you tell us your thoughts about the event's organisation and structure? Daniel: Of course I'm going to say that it was an excellent weekend! But even before I got to the final table and was lucky enough to hit the cards I did, I was thoroughly enjoying it. For the first ever major APAT event, it went very well from where I was sitting. The venue helped, and everyone involved from the APAT made it work. The other people who made it such a success were the players. Such a great atmosphere, without any intimidation or pressure on a newbie like me. Tony's request for anyone busting out to be applauded was a nice touch – and something that everyone wholeheartedly took on board. It was a privilege to play with such a great group of people, many of whom I hope to keep in touch with in one way or another. This was my first major live event, and the next one is going to have a lot to live up to. UKPN: Talk us through Day 1? How did you get up to 35,000 chips? Daniel: It feels so long ago now, but I didn't have a concrete strategy set out other than to play tight and sensibly early on, and then move through the gears as the blinds became more substantial. I was hoping to accumulate some chips so that I wouldn't become desperate too early. I wanted to play premium hands from any early or middle position, and look to be a bit more 'creative' from the button. Fortunately, I managed to get some good cards, and stayed ahead of the average stack for most of the first day. One important hand took place relatively early (just before half-way through the first day). I called a raise from an aggressive player (who had been dominating the table raising and re-raising frequently) from the button with AhJd. The flop came Jh 6h 4h. So I have top pair, top kicker, and a draw to the nut flush. I couldn't really put him on a hand (I actually thought he might have had an overpair, but I really didn't know), and when he bet just under the size of the pot, I decided it was best to call, see the turn card, and make a decision from there. The turn was a heart, and so I'd hit the nut flush and it was just a case of seeing if I could actually win any more from the hand. Unfortunately for him, he was holding the KhQh and had actually flopped the flush. When he bet on the turn, I re-raised him all-in and he was pot committed. I'd reached 60,000 chips at one point, but shortly before the end of the first day I had my KK come up against an all-in AJ, and a Jack on the flop and the turn gave him the hand – and dented my chip-stack considerably. I still managed to finish at about the level of the average stack, but I was conscious that the blinds were increasing and Day 2 would start at 1,500/3,000 meaning I was not very far off being short-stacked. UKPN: What were you realistically hoping for at the start of the second day? Daniel: With the size of my stack in relation to the blinds, I knew that I wouldn't be able to hang around for too long waiting for premium hands. So my plan from the start of the second day was to took for opportunities to steal the blinds and hopefully double-up when possible. I was also keen to avoid playing speculative hands where I could end up putting myself in a difficult situation for a large part of my stack. This worked well, and once I started to accumulate some chips my goal was to reach the last three tables, to play aggressively and reach the final table with enough chips to have a say. Again, I got the cards that allowed me to do this. UKPN: You seemed to be one of the steadier players at the final table, sitting quietly whilst others were more aggressive. Was this a deliberate approach? Daniel: When it was down to two tables, I was playing fairly aggressively, raising with a lot of hands when I thought it was right. I'd accumulated a fair few chips this way, along with two lucky river cards that did my stack no harm at all. When I got to the final table I was in a comfortable position not to be too desperate, and my plan was to continue to use aggression to continue to build my stack. Unfortunately, I had a run of shocking hole cards, and to make matters worse the other players at the table were playing very well. I just didn't have an opportunity to make many moves. I was short-stacked at one stage and was fortunate enough to get hands that I was willing to move all-in with, either to take the blinds or hopefully double up. UKPN: Talk us through the key 10 10 versus KQ hand with Matthew Milne when three handed. The tournament victory rested on that one moment didn't it? Daniel: There were two hands that shaped it for me. One was on the table before we reached the final 10, when Mark folded a hand that would have crippled me if he'd called. Instead I won a decent amount of chips, and could carry on with the same game plan. The other hand was definitely my KQ v Matt's TT. Matt had been bossing the table, and I certainly considered him as one of (if not the) strongest players at the table. When I saw that I had KdQd, I was ready to make an all-in move. If Matt had nothing, then he'd throw it away, so instead I made a bet of 100,000. Matt moved all-in. I had a choice then, either to back down, or go all-in (which is what I'd planned to do on the flop if he'd called). I couldn't put Matt on an exact hand, but thought that he might have had a small pair, or an ace. When he showed the tens, it was your standard race. But the queen on the flop meant it was my lucky day. Looking back, I'm not sure if I played that hand well at all. It all made sense at the time, but now I'm not so sure. Winning that hand put me in the driving seat with a huge chip-lead over Mark. We'd both said that after two days of poker, it was probably all going to come down to one or two hands heads-up! The first one I had 66, and pushed all-in. Mark called with AJ and doubled up when he paired the ace on the flop. That brought us to about level. UKPN: And the final hand. How did you stay calm when the flop came 8 2 2 and you had a 2 in your hand? Daniel: The second hand heads-up I held J2o. Mark called and I checked to see the flop. I tried to keep calm when the flop came down with two deuces on the board. Mark checked, and so I hoped to try and trap him and checked as well. I didn't feel calm at the time, and I'm glad that I didn't give my hand away. Mark checked again, and so I placed what I hoped would look like a steal. He re-raised me all-in and it was an automatic call. I was very happy to see that Mark only had a pair and then I realised that it could be over. It still hasn't sunk in yet. UKPN: Are you ready for EPT Copenhagen yet?! UKPN: Thanks for your time, and very well done again! You can find out how to join APAT at www.apat.com where you will also find the schedule of forthcoming APAT live events.